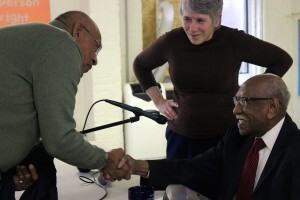 Timuel Black, 96, tells members of Third Unitarian Church in Austin what a crucial role MLK played in Chicago and across the country. Insurance agent Darren Tillis will host local senior citizens and young people Monday afternoon at a Cicero theatre. It will be held from 9 to 11 a.m., on a first-come, first-serve basis, at Alice’s restaurant, 5638 W. Chicago Ave. La Coulton J. 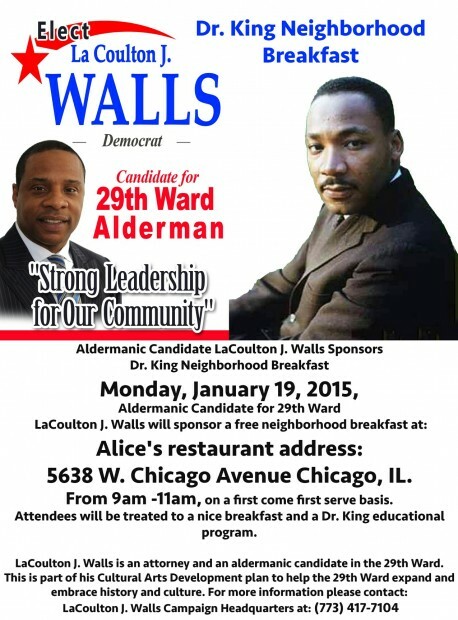 Walls, a candidate running for the 29th Ward seat, is the sponsor. Read columnist John W. Fountain III’s take on what’s happening in Ferguson. The 46th anniversary of Dr. Martin Luther King Jr.’s death will be commemorated Friday night at New Tabernacle of Faith Baptist Church. The Lambda Alpha Omega chapter of Alpha Kappa Alpha Sorority Inc. pitched in at the Fraternite Notre Dame soup kitchen Jan. 20 to honor the Rev. Martin Luther King Jr.
Local leaders and homicide victims’ relatives urge Chicagoans to break the code of silence. As part of its Martin Luther King Jr. celebration, Christ the King Jesuit College Prep will screen the Interrupters with a presentation from the cast and creator Monday at 12:30 p.m.